Our Nisqually watershed is a very special place, with abundant wildlife, wilderness, and diverse communities. We also have challenges to face. For example, from June 2006-May 2014 the Nisqually Glacier, headwaters of Nisqually River, has shrunk an average of 1 meter every 10 days! Our threatened Steelhead and Chinook Salmon are counting on that cold, clean clear water. We have lots of important work to do and appreciate your willingness to engage your class in hands-on environmental service-learning. 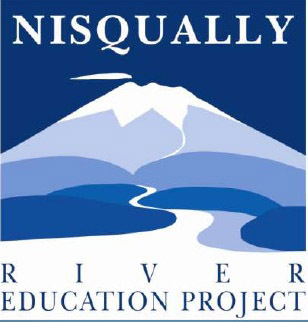 Twice a year, the students of the Nisqually River Education Project monitor the water quality of many of the tributaries and the mainstem of the river. These students range in age from 4th grade through high school. A comprehensive water quality monitoring program for teachers and students. Eye on Nature field trips to the Nisqually Wildlife Refuge. Salmon carcass tossing on the Nisqually River. Teacher and student educational resources.